What about a Celine box bag in navy? The Constance is beautiful too. Both forever bags. I choose E, all of the above! A Céline Box is a vey good idea, thank you. My Constance fits very little so it’s used as an evening or summer bag. Choose Constance. She would be a very good choice as a new friend! Constance!! She will hold her value. Can’t help feeling the JWAs and Loewes are just EVERYWHERE! 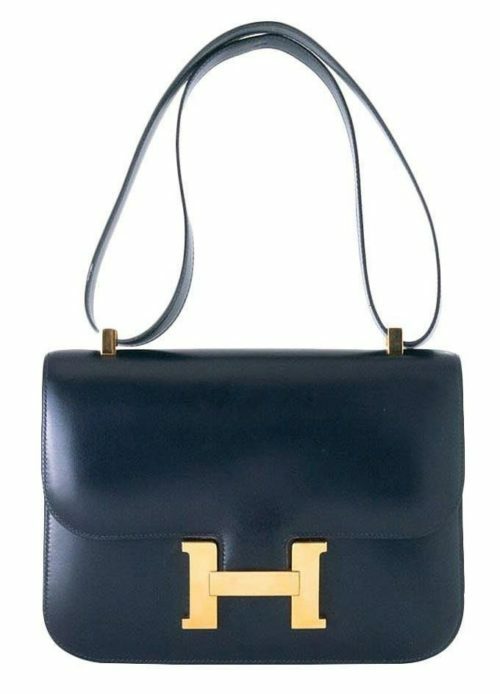 Have you considered the Hermes Bolide – totally gorgeous design and the deep Hermes navy is perfect? I love to wear navy and black together – so easy and elegant. Preston, if you decide to go the vintage route, my very favorite store is Decades in LA. They have a well curated selection. You might find a new navy inspiration there. Christos and Cameron are the co owners. Thanks Pamela,I love Decades and will certainly give them a ring. How about the Celine Trotteur? It comes in three sizes, can be worn as a shoulder bag or cross body, and comes in two leather choices (box or grained) depending on what type of look you like (and durability you need!) Celine’s shade of navy is gorgeous! I love my Celine box, but that doesn’t hold a lot of stuff either. Key, phone and wallet and small gloss. I can’t even fit my glasses. If I put my glassed in there, then my keys would have to come out. I absolutely love the Pierce. Its beautiful, modern, and classic at the same time. Love my vintage Constance. I use it all the time – it’s the perfect size in New York. And unlike the Celine box, it just gets better with time. You are more petite than I am so you could probably wear it crossbody – on me the strap is just a smidge too short, but I’m 5’8″.